The eight GRC runners set to toe the line in Boston on Patriots' Day could have found any number of reasons not to run the race. The brutal winter conditions made training difficult. Some runners are nursing injuries which have yet to heal. And one need not look far to find a faster course. But for these runners, the lure of the 118th running of the Boston Marathon has proven too much to resist. Patrick Murphy wanted to run so badly that in June he registered for a last second maraton just to hit a BQ. Julie Tarallo and Scott Koonce are racing despite nagging injuries. And Dickson Mercer, Teal Connor, and Kerry Allen, who are as fit as they have ever been, will be giving it their all on Heartbreak rather than holding out for flatter courses. These runners chose Boston because it is a special event and nothing is going to keep them away from this race. In all, Kerry Allen, Teal Connor, Julie Tarallo, Dickson Mercer, Patrick Murphy, Scott Koonce, Lavar Curley, Chris Bain, and Matt Rand will be lining up. These runners are repeat players in Boston and their spring racing schedule reflects a healthy respect for the rigors of the course. Almost every runner tested their mettle this spring at challenging events such as the RRCA Club Challenge Ten Miler and the Rock and Roll USA Marathon. For the women, Kerry Allen and Teal Connor are looking for big PRs. This spring, Allen hit signficant PRs at ten miles and the half marathon, culminating in a second place finish at RNR USA. Teal missed a significant amount of training after a big PR at Boston last year, but she is back at it and looking to make a big leap forward. "I don't like to make predictions about times in any event where the weather is such a major factor," says Coach Jerry Alexander, "but I do know for sure that Kerry and Teal are in the best shape of their lives, and capable of running much, much faster than their current PRs." After finishing in 2:37 last year, Dickson Mercer, a cerebral runner with a 2:29 PR, is hoping to solve the mystery of Boston. Mercer's training this cycle has been completely marathon specific, and from the standpoint of his fintess, he is capable of dipping south of 2:30. Murphy started the cycle with modest expectations, but things have been coming together for him lately and he is in a position to have a great race. Koonce, Curley, and Rand tuned up on the treacherous hills of Columbia, Maryland during the Club Challenge and are looking to have big days. 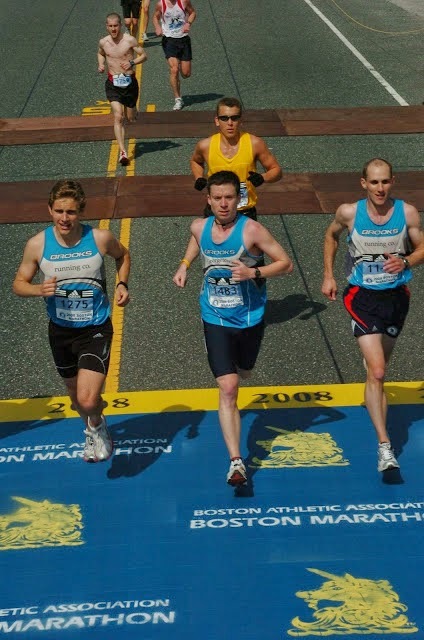 Chris Bain (seen above running with Murphy in 2008) has shown remarkable consistency over the years and is determined to keep his decade-long Boston streak alive. Good luck and run strong, everyone. Right on Hereford. Left on Boylston.